Extreme quick notification to a change. Energy efficient, it enables the transmission rate to be reduced maintaining current readings. Transmit sensor data at advantageous time periods (such as when a stainless steel refrigerator door opens). Two connections on the terminal blocks are used by discrete input (ground and in) which are labeled on the printed circuit board (see screw down terminal connections on the pictured example). In order to maximize battery life, it is important to wire the discrete input so the condition it is most often in is electrically open. This prevents the unnecessary consumption of the battery by holding the input high. There are numerous ways to utilize the discrete input within an application. It can be used to transmit a push button's state. Water consumption (or other liquids) can be tracked using a flow meter with a pulse output. Monitoring the state of doors (and windows) is very useful in security applications, monitoring traffic, and home automation. The door being monitored will normally be closed. The magnet will be positioned so the glass reed switch is by the magnet when the door is closed. The MeshNet Controller's user interface enables you to easily configure the sensor settings with a standard web browser. The configurations settings directly related to the discrete input are the capability to reset activity latch and the option to have the sensor transmit whenever there is a change to the discrete inputs state. The activity latch may be reset by clicking the currently reported status of the latch. This will cause the latch to be reset and flash a message (highlighted in pink) confirming the reset. 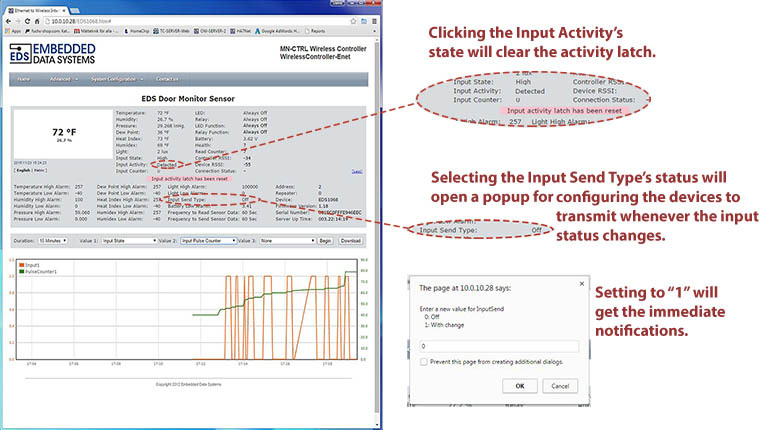 Configuring a change in the discrete input to trigger a wireless transmission is accomplished by selecting the "more" option on the sensor page, clicking the "Input Send Type", and then setting the popup to "1". The sensor will now transmit whenever the discrete input changes or when the timed transmission is due. Please note the "seconds counter" on timed transmissions resets whenever the discrete input triggers a transmission. Feel free to contact Sales@EmbeddedDataSystems.com if you have any questions about the discrete input or the MeshNet Sensor functions. 1. 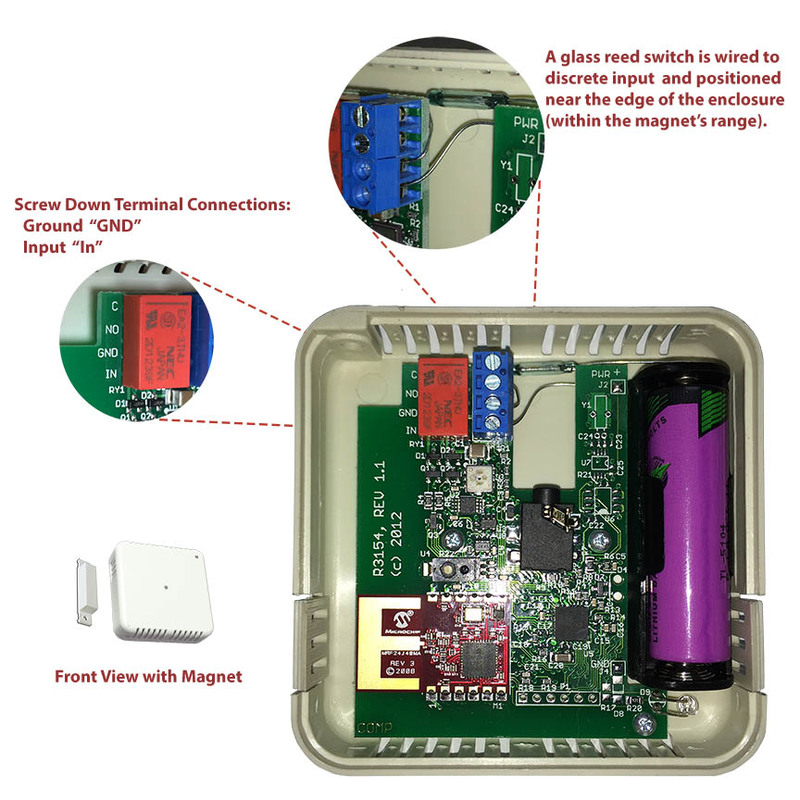 The prior version of the MeshNet Environmental Sensor, Rev 0, contained a pull-down resistor. 2. The glass reed switch pictured is a KSK-1C90U by Standex Meder Electronics. It features both a NO (Normally Open) and a NC (Normally Closed) lead which is nice for flexibility.